LASN is a photographically oriented, professional journal featuring topics of concern and state-of-the-art projects designed or influenced by registered Landscape Architects. 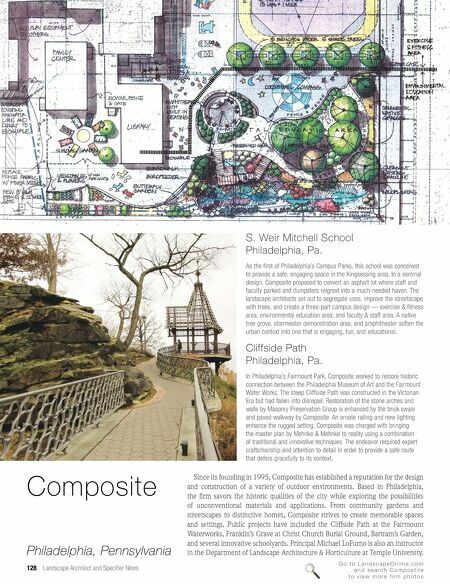 G o t o L a n d s c a p e O n l i n e . c o m a n d s e a r c h C o m p o s t i t e t o v i e w m o r e f i r m p h o t o s 128 Landscape Architect and Specifier News Composite Philadelphia, Pennsylvania S. Weir Mitchell School Philadelphia, Pa. As the first of Philadelphia's Campus Parks, this school was conceived to provide a safe, engaging space in the Kingsessing area. In a seminal design, Composite proposed to convert an asphalt lot where staff and faculty parked and dumpsters reigned into a much-needed haven. The landscape architects set out to segregate uses, improve the streetscape with trees, and create a three-part campus design — exercise & fitness area, environmental education area, and faculty & staff area. A native tree grove, stormwater demonstration area, and amphitheater soften the urban context into one that is engaging, fun, and educational. Cliffside Path Philadelphia, Pa. In Philadelphia's Fairmount Park, Composite worked to restore historic connection between the Philadelphia Museum of Art and the Fairmount Water Works. The steep Cliffside Path was constructed in the Victorian Era but had fallen into disrepair. Restoration of the stone arches and walls by Masonry Preservation Group is enhanced by the brick swale and paved walkway by Composite. An ornate railing and new lighting enhance the rugged setting. Composite was charged with bringing the master plan by Mehnke & Mehnke to reality using a combination of traditional and innovative techniques. The endeavor required expert craftsmanship and attention to detail in order to provide a safe route that defers gracefully to its context. 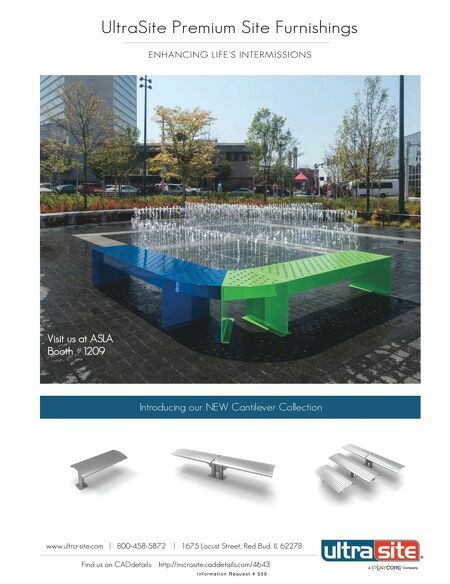 Since its founding in 1995, Composite has established a reputation for the design and construction of a variety of outdoor environments. Based in Philadelphia, the firm savors the historic qualities of the city while exploring the possibilities of unconventional materials and applications. From community gardens and streetscapes to distinctive homes, Composite strives to create memorable spaces and settings. Public projects have included the Cliffside Path at the Fairmount Waterworks, Franklin's Grave at Christ Church Burial Ground, Bartram's Garden, and several innovative schoolyards. Principal Michael LoFurno is also an instructor in the Department of Landscape Architecture & Horticulture at Temple University.